All of Kara’s comments in the Feedback group, for future reference. (She’s the only member of staff to comment in that thread.) Kara’s first response to comments. 21 members had reviews deleted without prior notice on Friday. Any shelves or reviews made after then won’t receive any notice about deletions. All content that has been deleted has been deleted for good and will not be reinstated and no copy is available for the reviewer to save. 1. JennyJen had 78 reviews deleted without notice. 2. Ridley had 36 reviews and 2 shelves deleted. 3. Archer had 6 reviews deleted. 4. Steph Sinclair’s due-to-author shelf and 13 reviews were deleted. 5. Bitchie had reviews and shelves deleted. 6. Kara had 20 reviews deleted. 7,8,9. Howdy YAL, Miranda, and Linda had shelves and reviews deleted. Underneath Linda’s post in the announcement thread are a few posts from Kara about how harassment from authors isn’t tolerated, they haven’t been hacked, and that it’s okay to talk about the author within the context of the book review. 12. Blythe also had content deleted with notice. At this point I should mention that the new Kindle Paperwhite possesses Goodreads integration. Having information on badly behaving and pulled to published authors on the book page isn’t going to sell books, but it will give readers the power to make an informed decision on who they choose to support with their money. Ceridwen is collecting all the info on the 21 members who had their shelves and reviews deleted. UPDATE (Oct 3): Here are her results with brilliant analysis. The most striking statistic: 65% of the sample of deleted reviews were for self-published books. She also touches on GR’s new and inadequate FAQs about Reviews & Shelves on Goodreads, which only states one change: a copy of reviews deleted on September 20th will be sent to the reviewers. And Steph’s due-to-author shelf is within guidelines. But, sadly, even comments underneath a review aren’t safe. Most of these people have been targeted, harassed and threatened by Stop the GR Bullies [this link won’t take you to their website but to a place where you can safely learn about them]. It makes one wonder if this is GR’s offenders list in the background of their shelfie? The shelf/genres box on right of every book page has been removed in some instances. For example, the shelf box is missing from this book, I think, because it’s by a badly behaved author, and the shelf names reflect this, just scroll down the page. The Badly Behaving Authors listopia was deleted. Listopia for positive author behaviour was also deleted. Objectively Bad Books listopia deleted. It was going to contain books with mutiple grammar and spelling errors, etc. GR deleted 5-star Harry Potter reviews. Kara says they didn’t delete any 5-star Harry Potter reviews. Don’t-want-to-read shelves are fine, apparently. Positve shelf called “shizzle” deleted. I love the picture. So it’s not just shelf names but how they’re being used. Brandi wrote: “Posters Rachael and Iola had questions that I was hoping we could get clarification on please? The shelves you mentioned above (african-american-authors, lgbt-authors, nobel-laureates, ya-authors, na-authors, male-authors, christian-authors) are all fine and fit within our guidelines. Strangely, not all author-based shelves will be deleted. GR finally figured out author blog posts aren’t flaggable – will look into it, despite this issue being raised multiple times in Feedback. Shows they don’t read all the threads. Update: We can now flag blog posts! This has now been immortalized in GR’s quotes database. This isn’t the only controversial policy to be implemented by Goodreads. 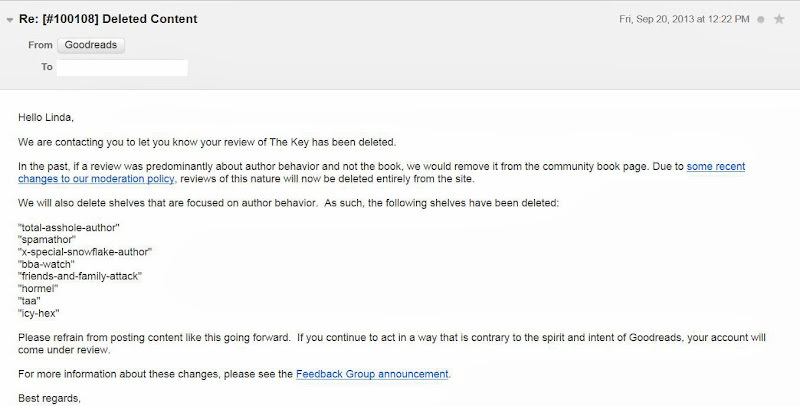 July 2012 saw the same types of reviews now being deleted being hidden or pushed down on the book page. And later that same month, they introduced a new button to shelve books which was dubbed the “UGB” = Ugly Green Button, that didn’t work properly and impeded on many users’ ability to use Goodreads. Few compromises or good will gestures were made, and for many members this was the beginning of the end. In March 2013, Goodreads announced they were “joining the Amazon family” which left many extremely unhappy. And now Amazon, a few days ago, has removed hundreds of self-published erotica titles based on these Content Guidelines, which appears to be another inconsistently applied policy. Therefore, Amazon may be behind GR’s new censorship policy. Or as Ceridwen postulates: GR got tired of STGRB’s flagging campaigns motivating them to implement these policy changes. Most feel GR have caved into the demands of badly behaving authors and those at STGRB by imposing this censorship. Top user leaves who had 3,000+ ratings, 1,000+ reviews and was a Goodreads Librarian. The Feedback announcement thread is littered with [deleted user] posts, though you do have the option to remove all your comments when you delete your account. Miss Jessie’s contributed 275,000 librarian edits, as an example of how much us members are worth to GR. People are receiving sponsored emails from GR. GR is sending out emails asking people how likely they are to recommend GR to others. Many are choosing to reduce their activity on GR: some librarians have gone on strike, some are no longer posting reviews, some are replacing the text in their reviews with links to their blogs, some are only staying for the groups, some are abandoning their accounts or deleting them altogether. But what they aren’t doing is keeping quiet about these changes. There are tons of reactionary protest blog posts, avatars, reviews and shelves as well. See Carol’s post for ways in which you can protest. Ability to download updates created by me and has both Emily and rivka responding. Private notes, private reviews and private shelves also created by me in an effort to compromise. To some of these, Kara, Emily, and rivka all responded too fast and enthusiastically; anything to seem helpful and responsive. I think they’re all helpless and scared that they don’t want to touch on the new policy. There are also other threads in which they are closing and redirecting people to the excessively long announcement thread in which they’re not responding to questions posed, and have persistently refused to make a site-wide announcement detailing these changes in policy. GR also appears unwilling to address the increasing level of author spam, paid for reviews, and sock puppet accounts. Is Goodreads Mocking Us On Banned Books Week? – I think they are. Those Quotes of the Day cannot be a coincidence. Authors encouraged to flag reviews. GR trying to prevent author meltdowns at negative reviews. Ilona Andrews asked what was going on at GR and said this site can’t be for both readers and authors. This has made the Washington Post and CNN, but the Washington Post is being sold to Jeff Bezos who founded Amazon. ‘Will authors benefit longterm? No. Eventually one of two things will happen. A) Readers will cave under pressure/fear and begin self-censoring reviews, the way I did with the flame-thrower-author. That will sound appealing to some authors, but remember. Consumer confidence depends on mixed reviews. Otherwise, consumers will assume the site is one big infomercial and ignore all the positive praise. If the dampening happens, the objectivity will be lost, and the objectivity (created by removing financial conflict of interest) will vanish. No objectivity, no marketing value. They’re going to introduce lots of new features to keep GR refugees happy. “Just to clear the air: EVERY potential “troll” will be monitored by us first before changing the status. Don’t worry!”. And BL have updated their Community Guidelines and Official Statement to reflect this. Acknowledging STRGB’s existence, and publicly taking a stance against them, is more than Goodreads have ever done. Some have chosen to start blogs so they can control their data because, ultimately, what’s happened at Goodreads could happen again elsewhere at some point down the road. It’s entirely up to you where you go from here. This is my BookLikes post you can reblog. IN CASE THIS POST IS DELETED BY GR, IT IS AVAILABLE HERE. *This an updated version of my original post. GRamazon’s takeover of Goodreads introduces Censorship and site wide top down enhancements to fit the Amazon Marketing Model. BEWARE!